The summary of the Gladiator Movie details the life of the hero of the film, Maximus Decimus Meridius. The summary of the movie Gladiator starts in 180AD with General Maximus Decimus Meridius leading the Roman Army against a barbarian army. The barbarians consisted of Germanic tribes who had been raiding the Northern border of the Roman Empire into Gaul for many years. The character of Maximus Decimus Meridius was shown as a great Roman General who had rose from the ranks during his military career which had started in the Roman province of Spain. General Maximus Decimus Meridius was favored by the Roman Emperor Marcus Aurelius admired by his daughter Lucilla and treated with some suspicion by his son Commodus. General Maximus Decimus Meridius leads his army to victory witnessed by Emperor Marcus Aurelius. Marcus Aurelius is dying and summons Commodus and Lucilla to meet him at the site of the battle. He first speaks to Maximus and tells him he wants to name him as his heir because he trusts him, thinks of him as the son he would have wished for and believes that Maximus would lead the senate in returning Rome to a Roman Republic. The honorable and moral Maximus is horrified at the prospect of being proclaimed emperor as he wishes to return to his wife and small son at his home in Spain. Marcus Aurelius summons his son Commodus and tells him he will not be Emperor and that the role has been offered to General Maximus Decimus Meridius. Commodus kills his father in a fit of jealous rage. Maximus is horrified when he learns of the death of his beloved emperor and realises that Commodus has murdered him in order to claim the throne. When Maximus refuses to support Commodus he is arrested. Maximus is informed that his family will also be killed. He manages to escape but is badly wounded in the process. Maximus desperate to save his family flees to his home in Spain. Maximus reaches his home but is too late to save his family. He discover the charred and crucified bodies of his wife and son in the smouldering ruins of his villa. Death by Crucifixion is a terrible and dishonorable way to die. Tortured by these thoughts Maximus collapses. Maximus is found by Slave Traders who take him to Zucchabar, a province in North Africa. He is accompanied by an African slave called Juba who befriends Maximus. Juba and Maximus are purchased by Proximo, the manager (lanista) of the local Gladiator school. Proximo is a hard man, an ex-gladiator who was granted freedom by Marcus Aurelius. The gladiators owned by Proximo have to fight in the local wooden arena. Maximus at first refuses to fight as a gladiator but then defends himself in the arena displaying his formidable combat skills to Proximo and his fellow gladiators. Juba and Maximus meet Hagen, a Germanic barbarian who also becomes their friend. Bitter and betrayed Maximus cuts out his shoulder tattoo S.P.Q.R. which Roman soldiers were required to wear by law. His friendship with Juba deepens and they talk of their families and their belief in the afterlife. Meanwhile the Emperor Commodus sponsors gladiatorial games in Rome to commemorate his father's death. Proximo is elated by the prospect. He acknowledges the great skills of Maximus and gives him some armor. Maximus realises that this might be an opportunity to wreak his revenge on Commodus. Proximo and the Gladiators arrive in Rome. The gladiators are awe struck by the site of the Roman Colosseum. Maximus and the gladiators are scheduled to fight in the arena of the Colosseum. Maximus meets the son of Lucilla, Lucius. Proximo is furious when he realises that his gladiators have been booked as a 'support act' fighting as Catervarii the name given to gladiators when they did not fight in pairs, but when several fought together. The gladiators were heavily armored. 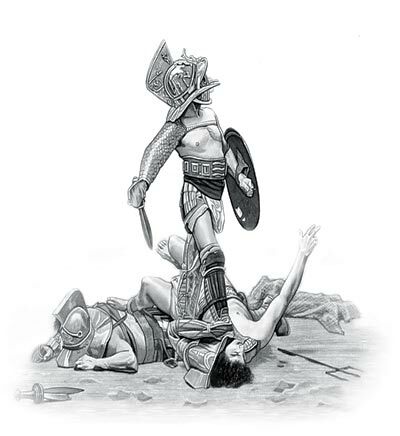 The movie depicts the gladiators fighting as Provocatores who were recognisable by their armor and weapons and easily distinguished by a helmet without crest called a Provocator Galea (helmet). The Provocatores were the only types of gladiators to have effective protection for the upper body in the form of a rectangular breastplate. The gladiators were fighting, as the losing side, in a re-enactment of the Battle of Carthage in the arena of the great Roman Colosseum. The Emperor Commodus, Lucilla and her son Lucius join the spectators in the Imperial box. Their opponents were Essedari (War-Chariot Fighters)who included Female Gladiators. Maximus, his features hidden by his helmet, leads Proximo's gladiators to a decisive victory against the more powerful force. The spectators roar their approval. Maximus, the anonymous Gladiator, is the hero. Commodus, followed by the boy Lucius, enters the arena to meet the victors and is stunned to discover that the the leader of Proximo's gladiators is General Maximus Decimus Meridius. Maximus threatens Commodus and would attempt to murder his enemy but the boy gets in the way. The emperor is unable to kill Maximus - the 'mob' decides who lives or dies in the arena. And Commodus needs the support of the 'mob'. The gladiatorial games continue. Commodus arranges for Maximus to fight against Tigris of Gaul, Rome's only undefeated gladiator. In the arena there are also chained tigers with handlers instructed to target Maximus. Maximus narrowly defeats the great Tigris and waits for a decision whether to kill or spare Tigris. Commodus indicates death but Maximus spares Tigris, insulting the Emperor but delighting the 'mob'. He earns the name "Maximus the Merciful". A furious Commodus starts to plan the death of his enemy. Lucilla, daughter of Marcus Aurelius and the sister of Commodus, meets Maximus. It becomes obvious that they had a past relationship. Lucilla persuades Maximus to join her and Senator Gracchus in a plot to overthrow Commodus. The plan is to reunite Maximus with his army communicating with them via his former faithful servant Cicero. Commodus suspects a plot and his sister's betrayal is discovered. Commodus threatens her young son Lucius and forces her to reveal the details of the plot. Praetorian guards are sent to the gladiator barracks. Proximo and the gladiators fight the guards while Maximus escapes. Hagen and Proximo are killed in the siege while Juba and the survivors are imprisoned. Maximus escapes only to witness Cicero's death. He realise he has walked into a trap as he is ambushed by a legion of Praetorian guards and captured. Commodus plots the death of Maximus in the arena of Rome. Commodus, himself wants to kill Maximus gaining the approval of the mob. He stacks the cards against Maximus by stabbing him with a dagger, puncturing his lung. Maximus is forced to fight with the the wound concealed beneath his armor. During the fight Maximus rips the sword from the hands of Commodus. Commodus requests a sword from his guards, but they betray him and refuse to lend him their weapons. Commodus pulls out a hidden dagger and renews his attack. Maximus eventually kills Commodus but is dying from his fatal wounds.